Brittany Allen and David Haverty in Ryan Is Lost. 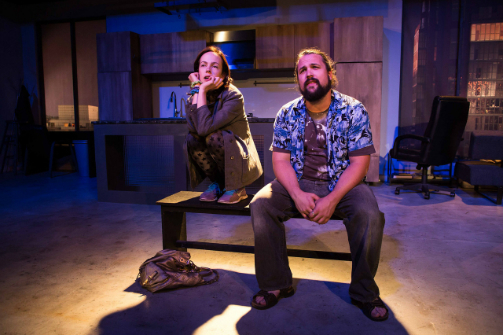 BOTTOM LINE: A provocative (if somewhat uneven) and well-acted play about how hard it can be to find yourself in a world full of uncertainty. Life, we are told, is about the journey, not the destination. So what happens when we begin to lose our way? What happens when our mistakes send our journeys haywire, and our most promising destination seems to be nothing more than a dead end? Playwright Nathan Wellman explores these questions in Ryan Is Lost, using a pair of struggling siblings as his case study for humanity adrift. What began as an ordinary afternoon at the mall for Frank (David Haverty) and his sister Avis (Brittany Allen), soon turns distressing as they realize that they have been separated from Ryan, their young nephew. Settling in on a bench and hopeful that Ryan will eventually turn up, the duo downs some booze and begins rehashing old arguments, suggesting that Ryan is not the only member of this family who has lost his way. Frank -- divorced, temperamental, and seemingly on the verge of becoming an alcoholic -- has been crashing on Avis’s couch, just as she continues to find herself on the wrong side of the law thanks to a hinted involvement with illegal drugs. Both pale in comparison to their prim-and-proper sister (and Ryan’s mother) Leah, and both lament their respective issues with their mother and now deceased father. And now that they have gone and misplaced Ryan -- a “good kid,” in whom they see promise for a better future -- they seem to have hit rock bottom. Under the direction of Michael Nankin, Haverty and Allen plow through Wellman’s script, crafting an authentically dynamic brother/sister relationship. Their rapid exchanges, equally packed with impassioned rage and solemn introspection, rarely feel insincere, even allowing them to overcome an unsettling incestuous turn late in the piece. Steve Shaw’s pre-show sound design also deserves acknowledgement. With some sweetly impersonal muzak, characteristic of many a shopping mall, he links empty consumerism with desperate escapism, identifying the play’s setting as a space in which many are, in some way, lost. Roughly an hour in length, Ryan Is Lost will not distract you from your own life journey for long -- but it will, hopefully, remind you of just how erratic that journey can be. No matter how far you have fallen, this play tells us, there is always more to lose. And so long as we continue making choices, there is always more to be found, too.